1956 ⊙ German Reich - 1872 / 1945, extensive used collection including better issues in the Schaubek hingeless illustrated album. With also Germania period, inflation period issues, Weimar with help in need sets 1924 and 1930 / 32, I. A. A. 1927, 1-4 RM. Zeppelin, as well much Third Reich with Wagner series, professions set, winter relief series, brown and blue ribbons, Nürnburg-race, Gdansk farewell series, Pair of olympia souvenir sheets with special cancel, all Hitler souvenir sheets, Munich Riem overprint block and so on. Favorable valued collection with very high catalogue value! 1961 ✉ German Reich / inflation - interesting collection from covers and cards with meter cancel from the years 1921 / 23 in the ring binder. In total 56 documents, with unusual material, different postage steps including rarely examples, different locations and postmark types and so on. An extraordinary object! 1967 ⊙ German Reich - 1872 / 1923, extensive used collection on KABE preprinted pages with numerous different issues, with also numerous Germania values including mark values, lots of inflation with useful issues, with also lots of genuine used material, as well also official stamps. Favorable valued collection with enormous catalogue value! 1968 ⊙ German Reich - 1923 / 32, interesting used collection Weimar Republic on KABE preprinted pages. As well better issues as for instance airmail 1926, I. A. A. 1927, all help in need sets from 1924 / 30, 1 RM. Polar travel, International Postage Stamp Exhibition souvenir sheet from 1930 on piece with appropriate special cancel and special registration note and so on. Very high catalog value! 1969 ⊙ German Reich - 1933 / 45, extensive used collection in the KABE illustrated album, nearly complete with a lot of better issues. With also 2-4 RM. 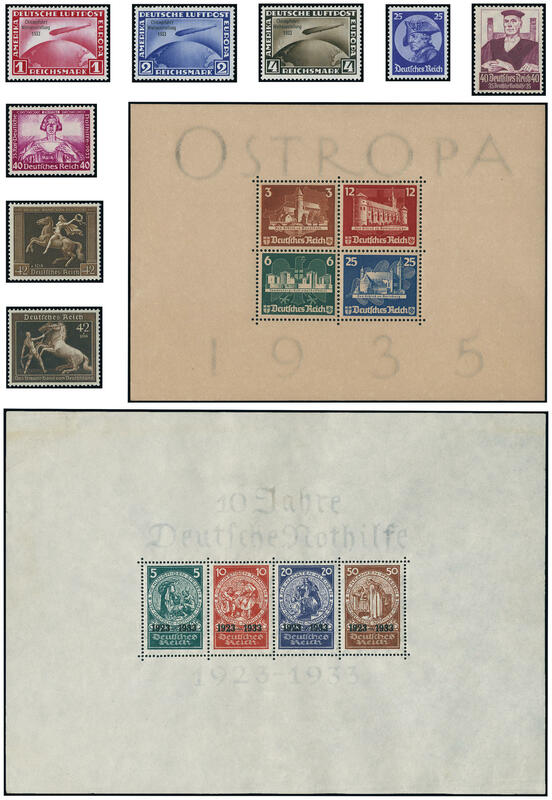 Chicago travel, Wagner set, trade set, Ostropa souvenir sheet 1935 with special cancel, Pair of olympia souvenir sheets, all Hitler souvenir sheets, Munich Riem overprint block, winter relief series, brown and blue ribbons, Nürnburg-race, Gdansk farewell series and so on. Favorable opportunity to acquire one nearly complete collection! 1993 ⊙/ / 8 German Reich - 1872 / 1945, enormously extensive inventory on stock pages with lots of material, mixed quality including superb pieces. As well a very interesting part breast shields with better values, with also Michel no. 8 used with photo expertize Hennies BPP, 2-80 Pfg. Germania-Reichspost unused, 5 Mark Reichspost unused, numerous inflation period issues, Weimar with 1 RM. Polar travel, as well much Third Reich, with also 2 RM. Chicago travel, professions set, winter help work issues, Gdansk farewell series, brown and blue ribbons, also island postage stamps, Germania se-tenants and so on. Favorable valued inventory with enormous catalogue value! 2030 ⊙/ 01. Jul German Reich - 1872 / 1945, interesting and rich collection in the KABE illustrated album with lots of material, mainly used collected. Many better values, slightly mixed condition, with numerous superb and extremely fine copies. Thereby also good part breast shields including Michel no. 1 / 7, 10 perfect centric cancellation, 16 / 23, 26, Germania-time including mark values, with also 5 Mk. Reichspost, numerous inflation issues, Weimar I. A. A. 1927, help in need sets, as well an extensive part Third Reich, with also Wagner set, Chicago travel 1933, a reduced charity souvenir sheet Nothilfe, Ostropa souvenir sheet 1935 with special cancel, special- and commemorative sets, all fours Hitler souvenir sheets, Munich Riem overprint block, winter relief series, brown and blue ribbons, Nürnburg-race, Gdansk farewell series, as well subsequent as well island postage stamps. Interesting object with very high catalogue value! 2057 /⊙/ German Reich - 1872 / 1923, extensive inventory in three large stock books as well a ring binder accommodated with lots of material. With also breast shield stamps, penny / pennies and crown / eagle, Germania period including mark values, as well an extensive part inflation issues, partly in stock created. With also multiples, parts of sheets and so on. Huge catalogue value! 2081 /⊙/ German Reich - 1872 / 1945, rich collection in the safe hingeless printed form ring binder with numerous different issues from the breast shields. With also Germania period including mark values, much inflation, Weimar, as well an extensive part Third Reich including complete sets, Munich Riem overprint block with first day special cancel and so on. Right up to SA / SS 1945. Favorable valued collection with very high catalogue value! 2097 /⊙/ German Reich - 1872 / 1945, extensive lot in the ring binder, as well housed in two large stockbooks. With also Germania, much inflation, numerous issues of the third Reich, official stamps and so on. Enormous catalog value! 2120 German Reich - very decorative embossed special album \"from Germany's heaviest time\" in leather with on face golden Imperial Eagle. Included are numerous various unused inflation issues, as well also government bonds and the different exchange rates from of the inflation period and so on. These albums were just after of the inflation period created. An interesting piece time and philatelic history! 2135 ⊙ German Reich - 1933 / 45, extensive used collection in the KABE spring back binder mounted on pages made up, all even forms and inscribed. As well numerous special- and commemorative issues, complete sets, souvenir sheets, winter help work issues and so on. Very high catalog value! 2136 ⊙ German Reich - 1923 / 32, extensive used collection Weimar Republic on KABE pages clean made up with inscription. As well numerous various issues, Zeppelin stamp, help in need 1930, I. A. A. 1927 and so on. Favorable! 2201 ✉ German Reich - 1875 / 1923, interesting and rich collection from covers, cards and postal stationery in two spring back binders clean made up with numerous attractive documents, interesting cancellations and frankings, numerous special feature, postal froms, a very nice part postal stationery, frankings of the inflation period and so on. A magnificent object! 2202 ✉ German Reich - interesting collection from covers, cards and postal stationery of the Weimar Republic in the spring back binder. As well nice documents, different frankings and postage steps, single frankings, registered, help in need 1927 on covers with postmark \"BERLIN Parliament 2.10.27. \" and so on. An attractive object! 2207 ⊙ German Reich - 1923 / 32, extensive used collection Weimar Republic with numerous good issues, almost completely formed. With also wood-pigeon 1924, airmail 1926, all help in need sets from 1924 / 32, International Postage Stamp Exhibition souvenir sheet 1930 with appropriate special cancel, 4 RM. South America flight, 2 RM. Polar travel and so on. Also a very nice part se-tenants exist with useful combinations and sought-after issues, including help in need. Interesting object with very high catalogue value! 2208 ⊙ German Reich - 1933 / 45, extensive used collection, in the number of a major listing except for souvenir sheet 2 complete in the lighthouse hingeless illustrated album. With also Wagner set in A and B-perforation, Chicago travel 1933 (1 RM. Expertized Schlegel BPP), trade set, Ostropa souvenir sheet 1935 with centered special cancel, all further souvenir sheets, brown and blue ribbons, winter relief series, Nürnburg-race, Gdansk farewell series and so on. Besides includes the collection an enormously abundant part se-tenants from Wagner with many different combinations including better issues, winter help work and so on. A magnificent object with very high catalogue value! 2209 Third Reich - 1933 / 45, clean mint never hinged collection in the Borek hingeless printed form ring binder with plenty of better issues, sought-after sets and souvenir sheets. With also Hindenburg mourning edge, colonial researcher, folk costumes set, railroad 1935, Pair of olympia souvenir sheets, winter relief series, brown and blue ribbons and so on. A beautiful quality object! Michel approximate 4900,- €. 2219 / German Reich - 1933 / 45, very nice collection, in the Lindner hingeless printed form ring binder, mainly mint never hinged formed. Included are naturally also all key values, with also Chicago travel 1933, Wagner set, Hindenburg watermark waffle, charity souvenir sheet Nothilfe in full original size, airmail 1934, trade set, Ostropa souvenir sheet 1935, all further souvenir sheets, Nürnburg-race, Gdansk farewell series and so on. A very nice and Cultivated object, favorable! 2233 ⊙/ / /✉ German Reich - 1872 / 1923, rich collection in two safe hingeless printed form ring binder with plenty of better issues, slightly mixed condition, with much perfect material. As well are also the breast shields complete available with additional still various pairs, furthermore penny / pennies and crown / eagle including color shades, pairs, extensive part Germania-time including mark values, as well numerous inflation issues. The collection is a little specialized formed, with also blocks of four, multiples and so on. An extensive object with enormous catalogue value!